Orange Proof Site. Landscape variability is a key feature of the Central Tablelands region. The NSW Central West and Lachlan catchments cover a combined 171,200 km2 of diverse landscapes and agricultural enterprises. Within these combined CMA regions the Central Tablelands is a key livestock production area. Broadly located in the Upper Lachlan, Lachlan Slopes, Upper Macquarie and Mid Macquarie sub catchments, the region (often referred to as the High Rainfall Zone – HRZ) has a more-or-less uniform year-round rainfall distribution and an average annual rainfall of more than 600mm. Altitude across the Central Tablelands exceeds 450m, with the higher parts over 1000m. The topography is mostly undulating to hilly, with a range of soil parent materials. 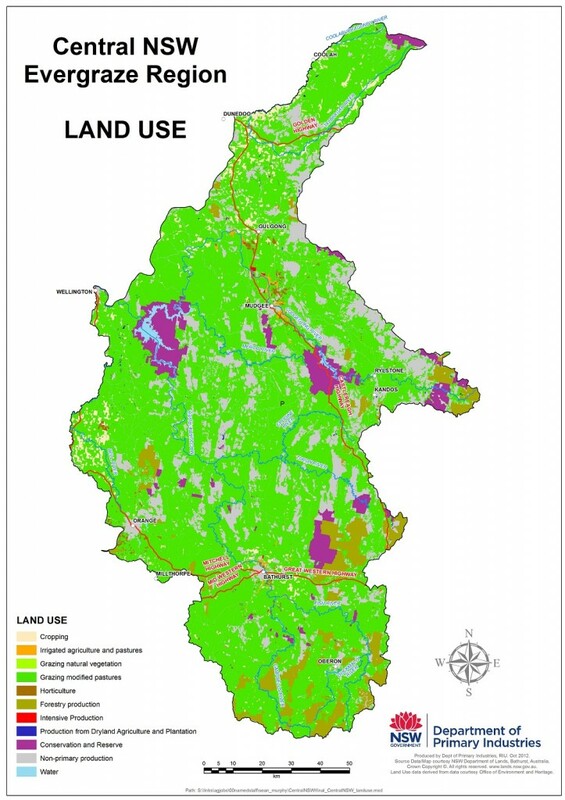 Land use in the upper portion of the Tablelands is presented in Figure 1. Typical farms in this region average around 500 ha with the majority of the farm area covered by ‘native’ or ‘naturalised’ pastures. Hence, the focus of the EverGraze research (Orange EverGraze Proof Site ) in this region has been on understanding landscape capability and developing management strategies for increasing returns while maintaining the condition of native pastures. The Orange Proof Site demonstrated that higher returns could be made from native pastures by fertilising according to production zone, running a higher value enterprise (Merino x Terminal) and lifting stocking rates using rotational grazing. With increasing rural subdivision around the major centers in the region the average property size is falling. The average stocking rate in native country is 3−5 dry sheep equivalents per hectare (DSE/ha) and cattle and mixed grazing enterprises average 5−8 DSE/ha. 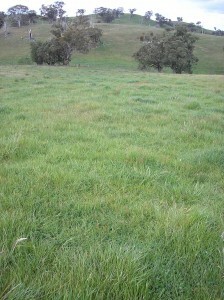 The cattle and mixed sheep/cattle enterprise usually have some improved native or introduced pasture in the system. 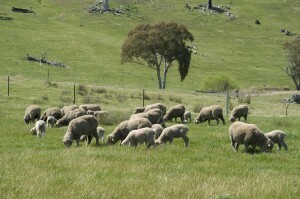 Sheep grazing for wool production was the dominant livestock enterprise across the region. However, when the reserve price scheme for wool was abandoned in 1991, there was a shift from wool production to beef production. The prolonged drought 2000−09 also led to a further reduction in stock numbers. With the change in lamb prices it is likely numbers of sheep might start to increase again.